For a short time in the 50s was Memphis , one of the most exciting places for young rock fans. The commercial successes that celebrated the Sun Studio with artists such as Johnny Cash, Carl Perkins and Elvis Presley, inspired many an others to imitate it to Sam Phillips, and to start a label. Among them was slim Wallace, who wrote a small but fine piece of rockabilly history with Fernwood records – which is unfortunately largely forgotten. That musically gifted lorry drivers were far bring it the King of rock ‘n’ roll himself had demonstrated. Slim Wallace was although not a singer, but he had his own band and a singer for slim Wallace it was Dixie Ramblers none other than Billy Lee Riley mid-50s worked. What should develop this for the history of Rockabilly, was at that time not yet, that Riley was an extraordinarily talented singer already. Accordingly, the first single of Fernwood records founded in 1956 by Riley and Wallace should be a single by Billy Lee Riley. However, the thing not so ran as Wallace had imagined them. Because when the numbers “trouble bound / rock with me baby”) dropped to the mastering at Sun Studio, Sam Phillips was so impressed that he immediately offered a contract with Sun records Riley.Thus, Wallace had to make a new start. This ended with the first single of Fernwood records, “Love gone / no chance” with the singer Ramon Maupin, a single, which unfortunately proved a flop. New impetus at Fernwood records ensured none other than Scotty Moore.The guitarist and longtime companion of Elvis Presley, was respectively slim Wallace now as the King of rock ‘n’ roll was conscripted into the army, Fernwood records as Vice President and Studio producer set. First of all, in this function, he added the measly even for the early days of rockabilly Studio equipment slim Wallace, which consisted of not much more than a mono tape recorder and two or three microphones. Besides, he made with his fine sense for modern rock ‘n’ roll for that label produced some notable rockabilly recordings in the next few years. In the musical accompaniment Scotty was a class apart along with his two former colleagues at Elvis Presley, bassist Bill Black and drummer D.J. Fontana already is. They were also often supported by Reggie Young, an other guitarists, which should evolve in the next few decades one of the most sought after session musicians in the United States. 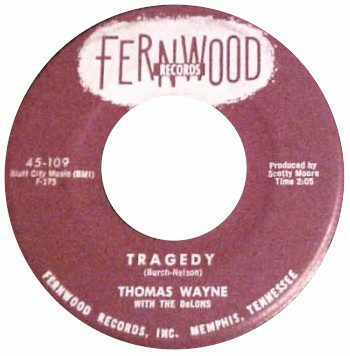 But only a Fernwood single, the ineffably cheesy ballad “Tragedy” by Thomas Wayne proved to be really successful. This was actually full name Thomas Wayne Perkins, and was the brother of Luther Perkins, who was known as the guitarist for Johnny Cash in the history of rock ‘n’ roll. The 1959 published tragedy, after all, made it to # 5 on the Billboard charts and sold more than a million copies. It was a success, Thomas Wayne nor Fernwood records could be repeated in the next few years. Fernwood of records, operated in the year of 1968, when a flood devastated parts of the seat of the label and destroyed almost all master recordings and plates. The last official single was released but already in 1965. While the success of Fernwood records within narrow limits, some shots of the label rockabilly fans today enjoy a high popularity. This includes for example the instrumental “Have guitar, will travel”, which took Scotty Moore in 1958 with Bill Black and D.J. Fontana.